When I went home for Christmas in 1995, I was an aspiring salmon biologist doing my Master’s research at the University of Washington, Seattle. By the time I returned to Seattle two weeks later, I was an aspiring evolutionary biologist. Now, 20 years later, I suppose I am an established evolutionary biologist, although I am still aspiring! I have worked on stickleback in British Columbia, guppies in Trinidad, and – of most significance to the present story – Darwin’s finches in Galapagos. I doubt I would have worked in any of these systems had it not been for one gift that fateful Christmas – a book. The book was The Beak of the Finch by Jonathan Weiner, something my mother had seen in a book store and thought I might like. For the next few days, I sat over the heater vent entombed in a blanket with only a pane of glass between me and snowy −25°C Edmonton, losing myself in the tale of two Princeton University evolutionary biologists, Peter and Rosemary Grant, and their quest to understand how evolution works through detailed long-term studies of Darwin’s finches. Most amazing to me was the description of how this work had demonstrated evolution occurring on very short time scales, sometimes only a single generation. I had never imagined that it might be possible to watch evolution take place in almost real time – yet they had done it. From that moment onward, I wanted to do the same thing and, within a few days of returning to Seattle, I went to the library and photocopied every paper by Peter and Rosemary. Slowly, the story emerged. 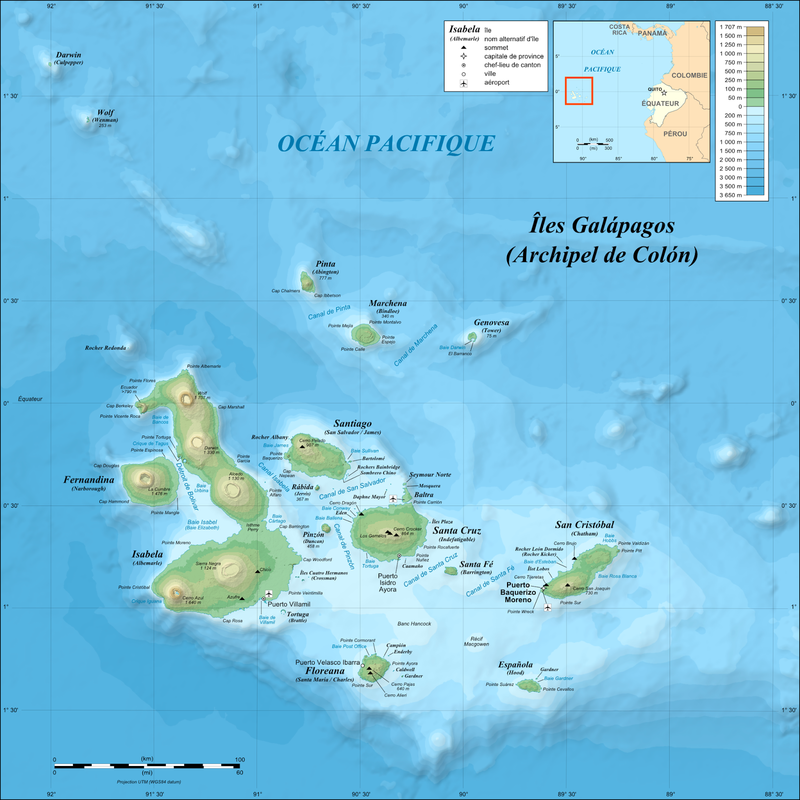 An image of the Galápagos Islands and their topography. Image from Wikimedia Commons. The Galapagos Islands were formed by magma welling up from a hotspot on the ocean floor to build underwater mountains, some of which broke the surface and became islands. When the first island formed, more than 8 million years ago, it had no terrestrial life given its 900+ km separation from the mainland. With time, however, various plants and animals either flew, drifted, or were carried to the islands. One of those colonists, arriving approximately 1.5 million years ago, was a bird – presumably a flock of them – that probably looked something like a modern-day grassquit. The Darwin’s finch ancestor may have looked this Black-faced Grassquit (Tiaris bicolor). Photo by C.J. Sharp on Wikimedia Commons. 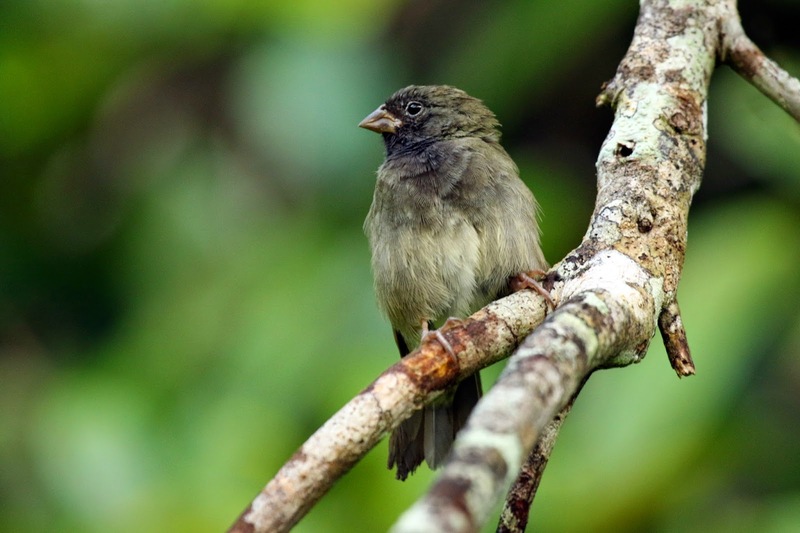 These colonizing proto-finches arrived in an ecosystem that had been assembled from the relatively few long-distance migrants that had reached the islands, some of which had then diversified into multiple species on the islands. This initial finchless ecosystem had a number of different potential food types (insects, fruits, seeds, and leaves of various sorts), but very few – if any – other birds to eat them. These first colonists were thus confronted with a land of “ecological opportunity” filled with a number of “empty niches” that might be filled by finches. The colonizing finches increased in abundance and spread across the various Galapagos islands. As they did so, they encountered different conditions. Some islands were very low and dry. Some islands were high and wet. Some had many insects, some had few. Some had certain types of plants, some had other types. Each of these different sets of conditions meant that a different way of feeding would be optimal at different locations. These different ways of feeding had a classic evolutionary target – the beak of the finch. 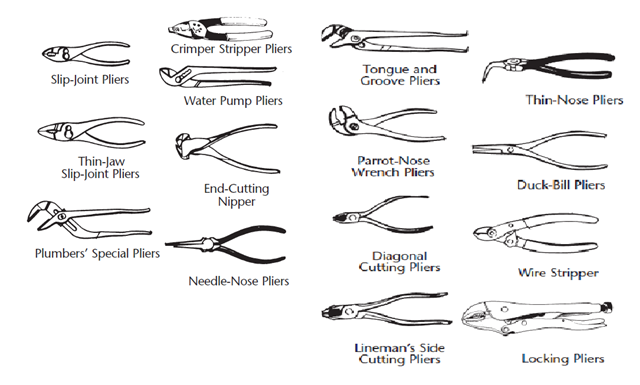 Bird beaks have been likened to pliers and, like pliers, different shapes and sizes are best suited for different tasks. The thin, pointed beak of a warbler is well-suited for gleaning insects, the long beak of a honeycreeper for probing flowers for nectar, the chisel-like beak of a woodpecker for tearing apart wood, and the robust rounded beak of a finch for cracking seeds. 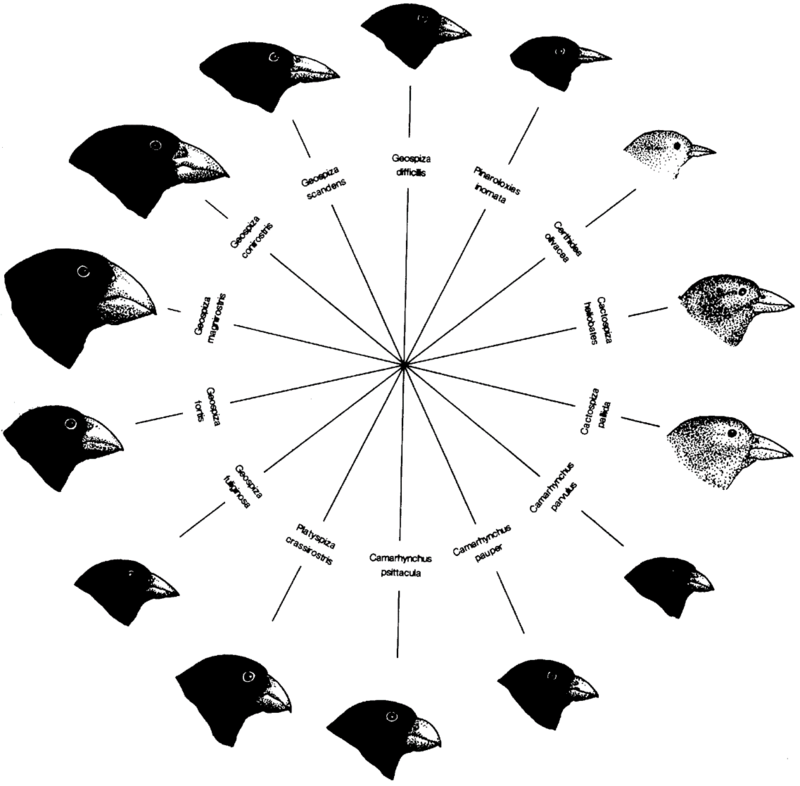 Thus, as the proto-finches spread across Galapagos and encountered different conditions, the different populations began to experience natural selection for different beak morphologies. Over perhaps a relatively short period of time, adaptation drove those different populations toward those different beaks, yielding a small pointed beak for insect eating (eventually to be called “warbler finches”), a long bill for nectar feeding (eventually to be called the “cactus finch”), a chisel-like bill for tearing apart wood (eventually to be called the “woodpecker finch”), a robust beak for cracking seeds (eventually to be called the “ground finches”), and so on. Yet, if it is geographic variation in food types that drives this “adaptive radiation” of finches, how does one end up with multiple species at any given location – as is currently the case in Galapagos? Given that the proto-finches spread to the diverse locations in Galapagos in the first place, it seems just as plausible that newly-evolving species could similarly spread to different locations, some of which would already host locally-evolved species. If the end result of this “secondary contact” is to be a multi-species finch community, two requirements must be met. First, the invading species has to have a different diet than the resident species – otherwise one species will simply out-compete and thereby exclude the other species (“competitive exclusion”). Second, the invading and resident species can’t interbreed too much – otherwise they will simply fuse together into a single species. Fortunately, these two requirements often seem to be met for Darwin’s finches in Galapagos. 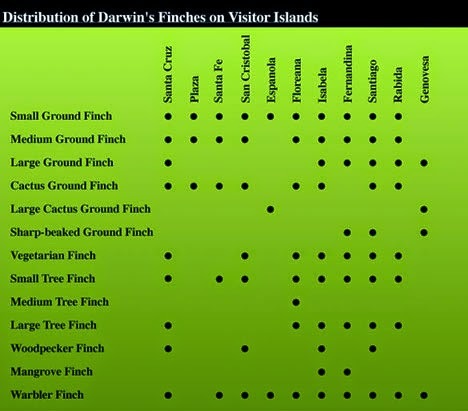 Crude depiction of the distribution of different finch species on the different islands. From A Field Guide to the Birds of Galapagos by Michael Harris. Collins. First, the previously described situation in which populations in different places show adaptation to different food types means that species coming into secondary contact have already specialized on somewhat different food types, thus reducing competition. This initial divergence can increase following secondary contact due to selection against individuals that have traits/diets/behaviors most similar to the other species, and that therefore experience the highest competition. The resulting process of “character displacement” will then further reduce competition and promote species coexistence. David Lack's classic demonstration of character displacement. Image from Ricklefs' (1996) Economy of Nature. Second, the traits (beak size and shape) that undergo adaptive divergence influence mate choice so as to reduce interbreeding. 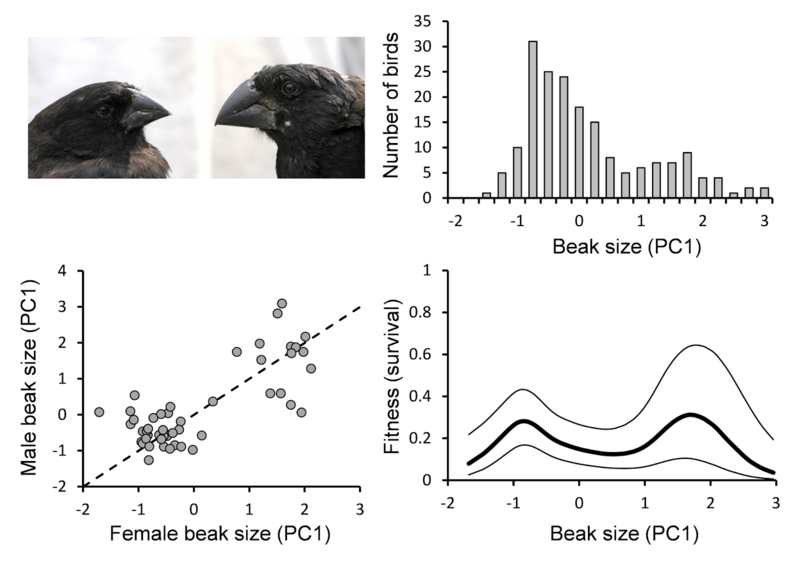 In particular, beak size is strongly correlated with the types of songs that males can sing: for instance, large-beaked individuals cannot sing rapid and complex songs. Thus, adaptation to different food types should cause divergence in songs as an incidental byproduct. Moreover, offspring tend to “imprint” on the songs of their fathers and, at maturity, male offspring sing those songs and female offspring prefer similar songs. As a result, birds that have evolved different beaks automatically show reduced inter-breeding – making beaks an outstanding candidate for the so-called “magic traits” of speciation. Moreover, any successful interbreeding between species (which does occur reasonably often) produces offspring with intermediate beak sizes that have low survival rates because they are not well-suited to the diets of either parental species. Different finches sing songs with different vocal properties. From Podos (2001 - Nature). This rough thumbnail sketch provides a crude summary of the process of adaptive radiation in Darwin’s finches as it was understood at the end of the 20th century. 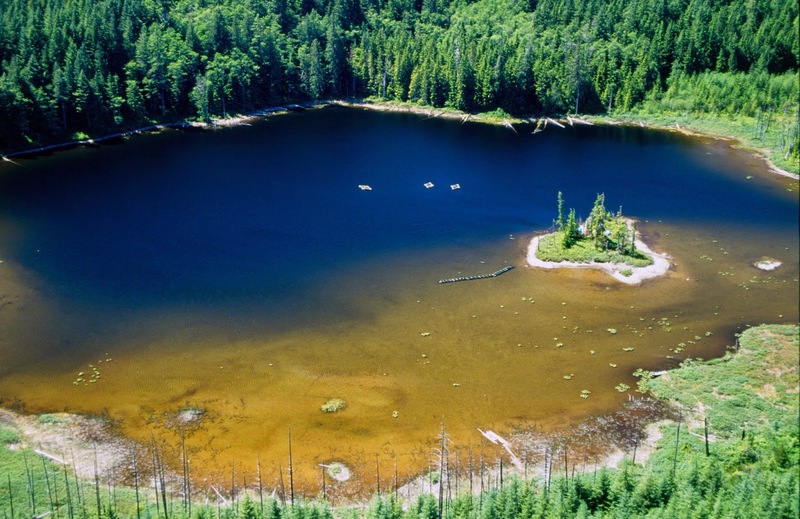 One of my stickleback experiment field sites on Vancouver Island. Less than a year later, I was ensconced in the Department of Organismic and Evolutionary Biology at UMASS in Amherst. My project was a logical extension of my PhD work and focused on natural selection acting on introduced Atlantic salmon in a restoration project for the Connecticut River. While at UMASS, I became friends with a new faculty member across the hall, Jeff Podos, who had started working on Darwin’s finches and had just published a paper in Nature about the vocal constraints faced by birds with different beak sizes. Soon afterward, Jeff received an NSF “Early Career” fellowship that enabled him to – pretty much – do whatever he wanted for research. So Jeff started assembling a team for new Darwin’s finch work and asked if I wanted to come along. Twist my arm. Some of the Darwin’s finches I first encountered. Clockwise from upper left: medium ground finch (Geospiza fuliginosa), medium ground finch (Geospiza fortis), large ground finch (Geospiza magnirostris), cactus finch (Geospiza scandens), small tree finch (Camarhynchus parvulus), vegetarian finch (Platyspiza crassirostris), and woodpecker finch (Camarhynchus pallida). In 2002, after all those years of reading and thinking about Darwin’s finches, there I was actually in Galapagos looking at Darwin’s finches hopping about on the ground making, as David Lack had said, “dull unmusical noises.” My goal that first year was simply to learn as much as I could about the finches and to think broadly and creatively about various projects that I might do in collaboration with Jeff and his team. One of the highlights that first year – perhaps even a rite of passage – was the afternoon I spent walking around in the field with Peter and Rosemary. 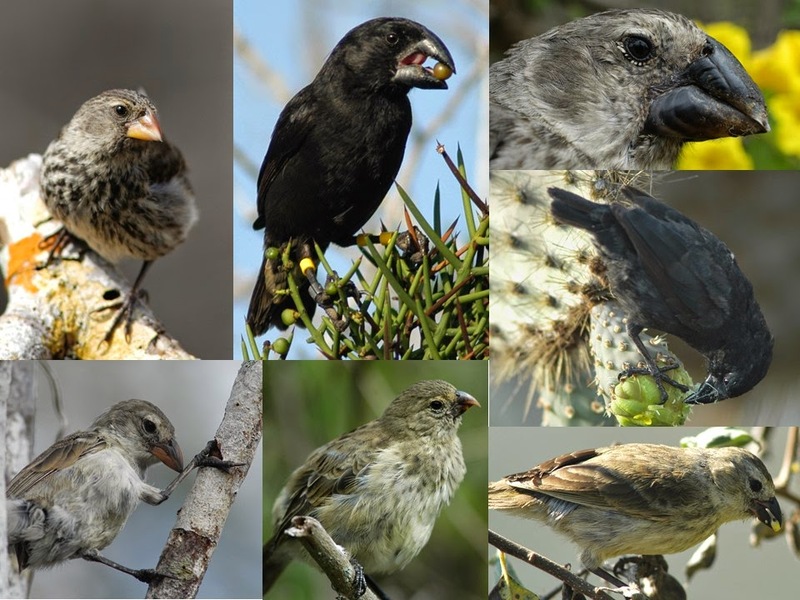 Now, 15 years later, a number of projects have come to fruition, some of which have modified the basic tale of the adaptive radiation of Darwin’s finches as described above. As described earlier, a critical mechanism by which two young Darwin’s finch species coexist when they come into secondary contact is through adaptation to different resources. The assembly of a community of finches thus depends critically on the extent to which different species partition their resources. One of our first goals was to understand how this partitioning took place, so – starting in 2003 – we began what would become a long program of simply walking around our field sites, finding birds, identifying them (through binoculars) to species, and determining on what they were feeding. This task has been greatly facilitated by the fact that Darwin’s finches are very tame. In the early stages of this work, we were quite surprised to see that, contrary to our initial naïve expectations, most of the species seemed to be feeding on pretty much the same things. Where was this niche partitioning that was supposedly so critical to the adaptive radiation? Those first years were very wet, with lots of plant reproduction, lots of seeds, and lots of insects. But then a major drought occurred and, for several years, plant reproduction was minimal and so seed and insect abundances declined dramatically. Fortunately, we had continued to record what the finches were eating throughout this period. During these drought years, we found that the different species increasingly diverged to use different resources – and niche overlap decreased accordingly. Thus, with 5 years of feeding observation data spanning wet and dry years, we were able to conclude: These results together suggest that the ground finches are ‘imperfect generalists’ that use overlapping resources under benign conditions (in space or time), but then retreat to resources for which they are best adapted during periods of food limitation. These conditions likely promote local and regional coexistence (De Leon et al. 2014). This finding that niche overlap decreased in years when little rain fell fit well with earlier observations that niche overlap decreased during the dry (as opposed to wet) seasons within a year. We first formally confirmed that the G. fortis population under study (at El Garrapatero on Santa Cruz) was indeed bimodal (Hendry et al. 2006). We then used this bimodality to test a series of predictions stemming from the theory of adaptive radiation – and the results confirmed expectations. (1) The two morphs had different diets, with the large morph generally eating larger/harder seeds (De Leon et al. 2011, 2012). (2) The two morphs differed in their feeding performance, with the larger morph that fed on larger/harder seeds having higher bite forces (Herrel et al. 2005, 2009). (3) Males of the two morphs sing different songs and respond differently to each other’s songs (Huber et al. 2006; Podos 2010). (4) The two morphs mate assortatively: small females with small males and large females with large males (Huber et al. 2007). 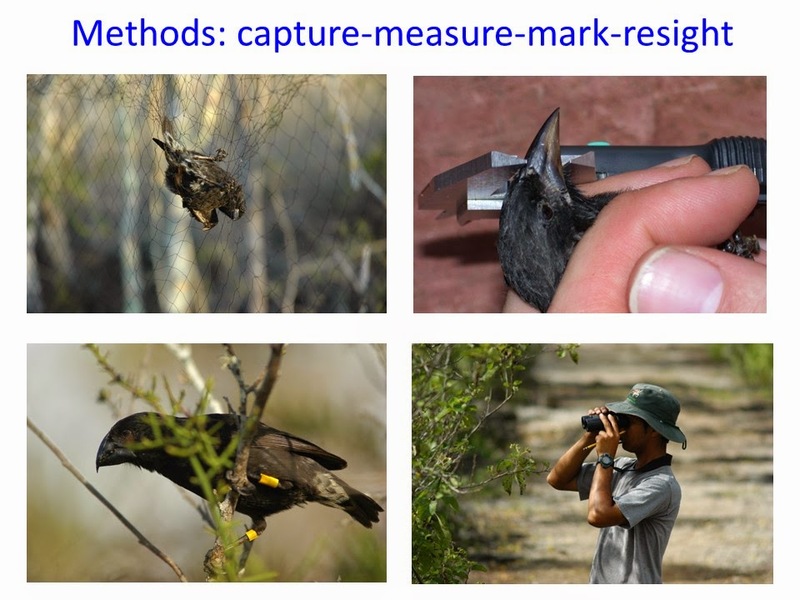 (5) The two morphs experienced “disruptive selection” in that intermediate birds survived at lower rates (Hendry et al. 2009). (6) Gene flow was somewhat limited between the morphs in that they showed some (albeit minor) differences at neutral genetic markers (De Leon et al. 2010). 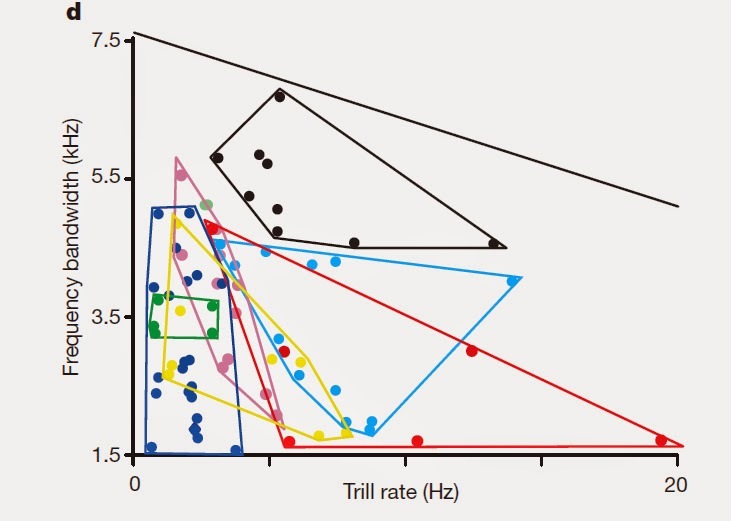 All of these findings supported the general model for adaptive radiation in Darwin’s finches: different diets leads to song divergence leads to different traits leads to reproductive isolation. 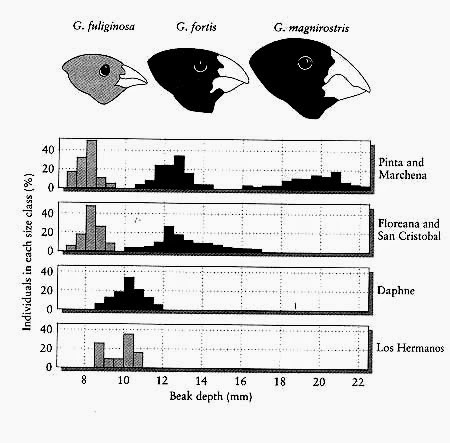 In 1973, you published a wonderful paper arguing for bimodality in beak size distributions in G. fortis at Academy Bay. I have recently compiled morphological data from Peter Grant and other investigators from a variety of sites on Santa Cruz island. I am now testing for spatial and temporal variation in the extent of bimodality. This work would be greatly aided if you happened to have the raw data from your 1973 paper. … I hope that you have these data and would be willing to send them to me. It would be much appreciated. Amazingly I have found the data in my room. It is in old notebooks - no Excel spreadsheets in those days! I can enter the data into a spreadsheet but not right away. … Do you want date of banding - all August to October 1968 I think? And so, not much later, I had the original data in hand, which was particularly exciting given that it was collected in the year I was born! Compiling all of these data made the picture clear – bimodality had decreased substantially in Academy Bay G. fortis some time soon after Hugh Ford’s study (Hendry et al. 2006). Noticing that these decreases coincided closely with an exponential increase in human population density, we argued that humans were altering the food resources that had been so fundamental to shaping finch diversity. 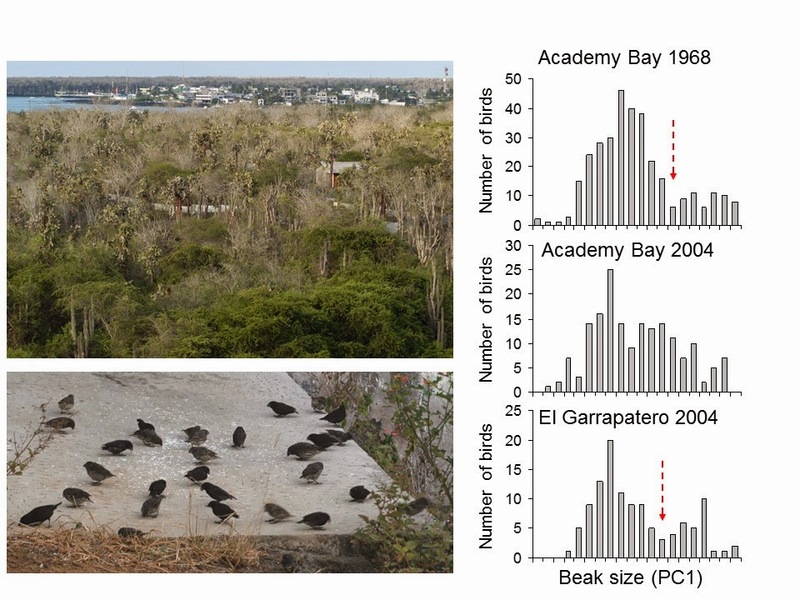 By subsequently comparing contemporary G. fortis from Academy Bay and El Garrapatero, we provided support for this hypothesis by showing that associations between beak size, diet, bite force, and genetic variation were all now much weaker at Academy Bay than El Garrapatero. Humans, it seems, can alter the “adaptive landscape” for finches and thereby reverse the process of adaptive radiation (De Leon et al. 2011). Whether or not such effects can extend to the more discrete species of Darwin’s finches, which do still hybridize, remains to be seen. Top left: Academy Bay. Bottom left: finches eating rice provided by humans. Right: bimodality at Academy Bay the year I was born and at El Garrapatero when we started our work, but not at Academy Bay in the same year (2004). 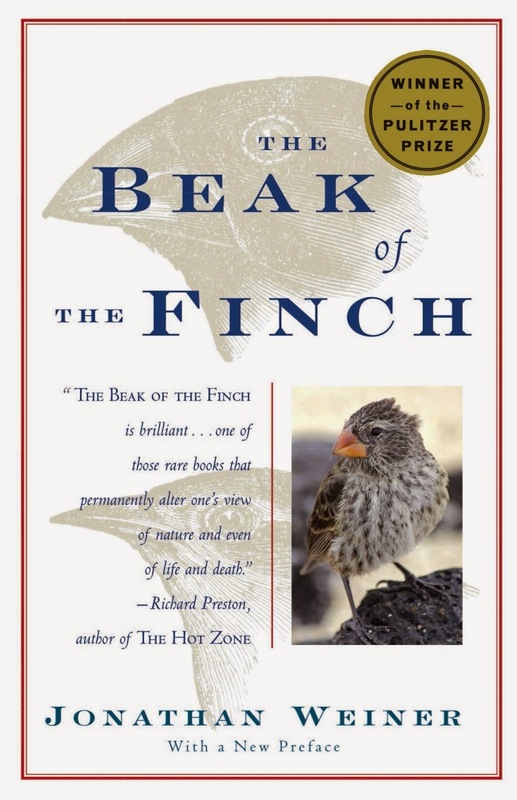 From the inspiration initially provided by that one book my mother gave me back in 1995, my career has followed quite an arc, to the point where I am now contributing knowledge to our understanding of the adaptive radiation of Darwin’s finches. Sometime in the mid-2000s, I received a phone call from Jonathan Weiner, the author of that fateful book. He wanted to talk about some related work I had done on fishes. What fun it was to be able to tell him how influential his book had been to my own career path. But where to now? The next frontier for Darwin’s finches is genomic work. Just this year, an initial study was published exploring genomic variation among the various finch species – and we have begun our own work on the topic. Over the next decade or so it seems likely that we will have answers to many questions that research on adaptive radiation has long pondered: how many genomic regions are involved, how big are the effects of particular genes, which specific genes are involved, and are the genes involved now (at the tips of the ongoing radiation) different from those that were involved earlier (at the deeper splits of the radiation)? Another critical frontier is to examine how finches influence the evolution of plant traits and assembly of plant communities – work we are now starting with Marc Johnson, Nancy Emery, and Sofia Carvajal. Much work remains to be done, and I am curious to find out just how Darwin’s finches will continue reshaping my life and career.